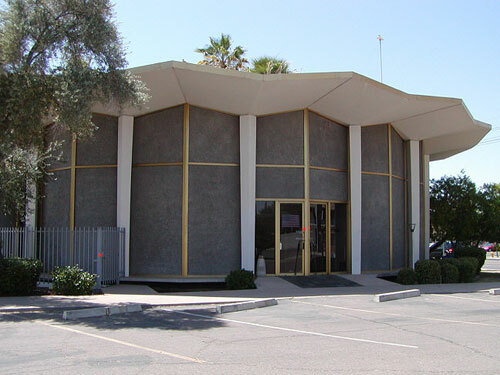 The first collision between the banking industry and architectural modernism is usually attributed to SOM and the Manufacturer's Hanover Branch Bank in Manhattan in 1954, but was actually led by Wenceslas Sarmiento on the west coast, who had studied under Oscar Niemeyer, who built the 1953 mid-Century landmark Glendale Federal Savings Building and a whole lot of forward-looking branch banks in Los Angeles, who then moved to St. Louis and operated nationally, who in Phoenix is responsible for the Financial Center (the eccentric curved tower with the slits in the back, standing next to the two white cakes and the upended pyramid) at 3443 N. Central Avenue, and who is still around in Santa Monica if you want to talk to him / argue with him. It was a social revolution too. Well, maybe that's going too far, but back in the 1950s the banking industry occupied a more prominent place in the community and in the popular imagination, and before the widespread use of ATMs it was, of course, still necessary to go to the bank if you had business to do. Even as banks established networks of suburban branches, those mental / architectural images of conservatism, solidity, stability, and vaultishness were still important. There were important social expectations to be met. 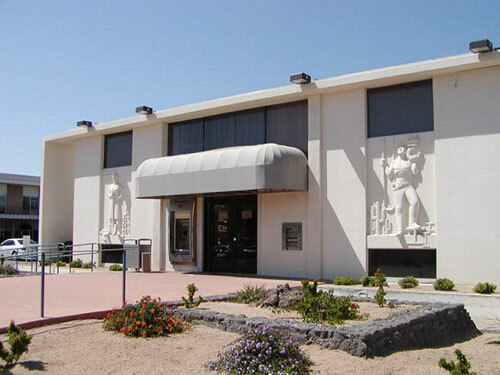 The Manufacturer's Hanover Branch became famous for flaunting its huge vault close the sidewalk and behind a single pane of glass, but it was still a sober and orderly building. That changed in the 1960s. Suburban banks got weird. Attribute it to the new ability to compute hyperbolic paraboloids and build them in concrete, attribute it to the Space Race and the New Frontier, blame it on Buckminster Fuller, or fluoridated water or whatever you like, but Phoenix was hardly the only American city blessed with strange banks advancing quickly past Modernism into Extraterrestrial Extremism. As examples there's the State Capitol Bank in Oklahoma City, The Trust Company Bank in Atlanta, the Wyoming National Bank in Caspar, and a ton more. According to a friend of mine of some years, a longtime Phoenix native and former classmate of Mrs. Walter Bimson, there was a good deal of negative reaction to this sort of thing in Phoenix -- undignified for banks to enter into a vulgar form of showbiz, to compete on the roadside. Now the banking business has become almost completely electronic and the entire building genre, like the elaborate movie palaces of the 1920s, is outmoded. Money doesn't have time for this anymore. 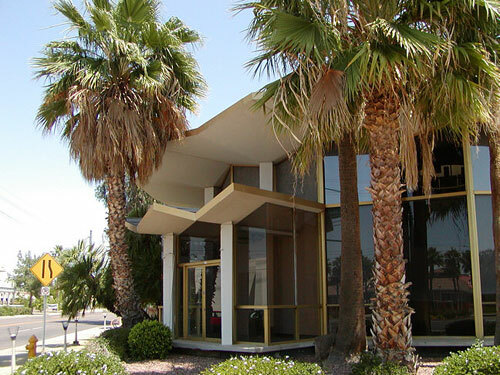 There were three major consumer-oriented banks that dominated Phoenix for decades: Valley National Bank, First Interstate, and Arizona Bank. As the VNB branches are covered exhaustively in this feature, here are a few notable examples from other financial institutions. 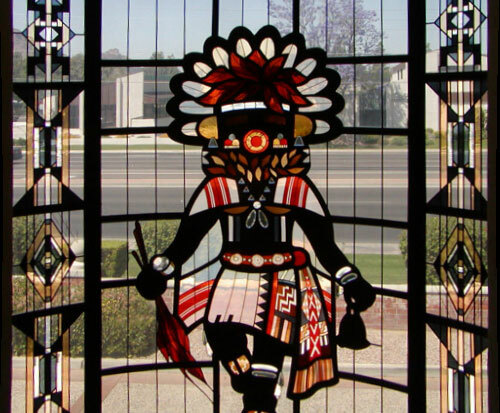 Arizona Banks were kachina-happy. It was their logo. 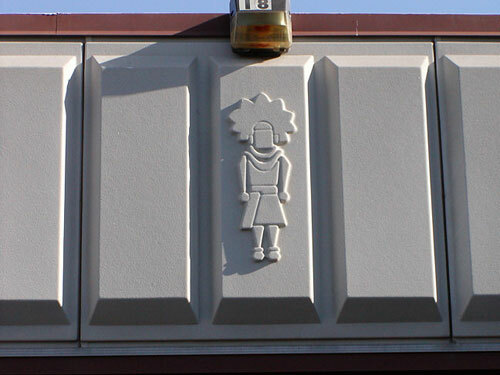 You can still find friezes of repeating kachina-patterns on branch banks on the west side, in Glendale and Peoria, and some of them look pretty silly. This particular example of curved stained-glass is in a former Arizona Bank at Scottsdale and McDonald, a handsome and competent building with a nice high car-concealing berm. The circular Washburn Piano store was built as a bank, my guess is 1973, by architect Ed Varney, and closed in 2005. A lot of people seem to have an affection for this building, if only as a novelty. Unfortunately, at least from the outside, it doesn't repay close attention. The materials and geometry give it a Vegasy impermanence. 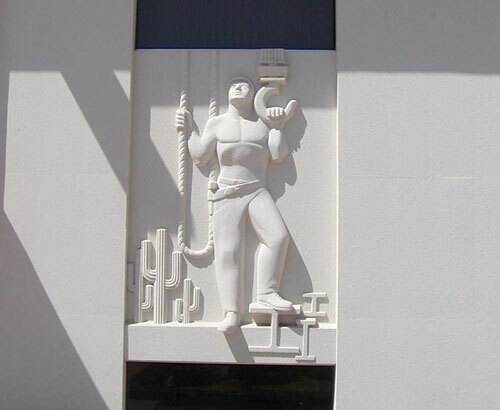 Also at 22nd Street and Camelback, directly across the street from the former Washburn Piano, is the former Western Savings, shown here biting the Arizona Banks kachina motif. Year unknown, architect unknown (Frank Henry identified him as "Frank.... Somebody"), and sculptor unknown. It is currently a Bank of America branch, no drive-through available. 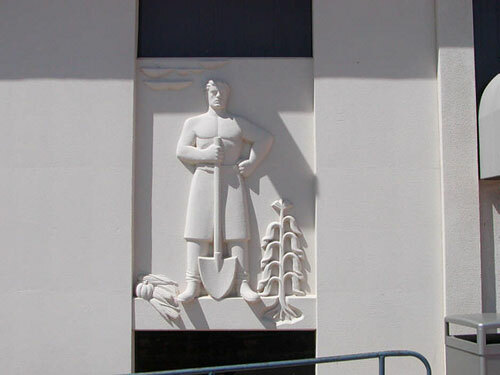 I think of it as Soviet Savings, not only because of the big white reliefs of heroic workers, but because the placement of the reliefs and the extentions on the sides of the building (not pictured) remind me inexplicably of Melnikov or somebody like that. It may not be the best building, but it's memorable. 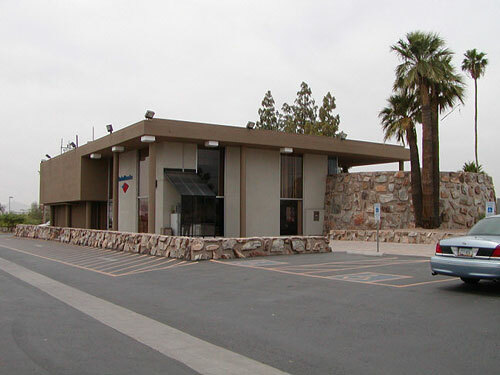 This former Arizona Bank Stockyards branch is from 1970, school of William Pereira, Los Angeles. It stands right next to the Stockyards Restaurant on Washington Street, in a kind of strange no-man's-land neighborhood around a couple of highways and the airport, within shouting distance of Tovrea Castle. The less said about its awkward collision between geometric forms, its rubblestone overdose, its impenetrable kiva and its maddeningly dull colors, the better; it's included here for the sake of completeness and out of respect for Pereira's other accomplishments. You can't win 'em all. 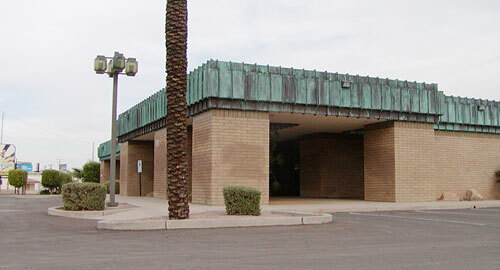 Former Valley National Bank at 915 East Camelback Road, its entrance currently torn up (according to my Cougar's suspension, "asunder") for Light Rail construction, built 1978, James Flynn & Associates and last occupied by a Goldberg and Osbourne law office branch.